Chennai Super Kings (CSK) was suspended for two editions of IPL and now, they back again to compete with seven other IPL teams. Because of various reasons, Aircell went out from the sponsorship in this season. So the Muthoot Group has inked a three-year deal with the franchise from 2018 Indian Premier League season to be their Principal Team Partner. Star India bought official media rights to broadcast and digital rights for next five years. Overall, this IPL will be with new colors. Also, now it is easy to buy CSK Tickets on online. Because of the CSK return after two years, it might become tougher to get the tickets online to see their games. Don’t waste your time by trying to purchase tickets offline and try to buy CSK tickets IPL 2018 on online for all CSK home games. Fans can book CSK tickets for home matches from chennaisuperkings.com and bookmyshow.com. Also, visit Insider.in and Paytm to buy the tickets to avoid the buying tickets from the counters. Kindly Book all CSK tickets online Here! As mentioned early, it varies based on the stand you select. 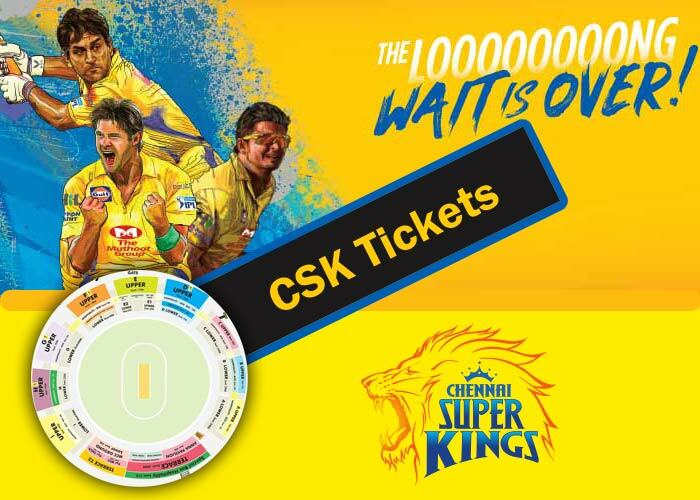 CSK Tickets are available between Rs 1500 to Rs 6000 and onwards. The long wait is over to see former India and current Chennai Super Kings skipper MS Dhoni’s famous helicopter shots at the MA Chidambaram Stadium (home) in Chennai along with his players from 10th April. But the first game for CSK will be with Mumbai India on 7th April at Mumbai as away game. Note: Once the Ticket booked, you can’t get refunds or cancel the tickets. Refunds will only be made if the Match is canceled without a single ball being bowled. Go with CSK jersey to watch a match at Chepauk. Buy IPL 2018 CSK Jersey, T-shirt online. If you can’t get CSK tickets or confuse about the online purchase, then visit directly to the TNCA Box Office at the MA Chidambaram Stadium’s booking window. You should visit between 9.30 am and 12.30 PM in morning and between 2 pm and 6 pm in evening on a day before the match. The first VIVO IPL 2018 match scheduled to play at Wankhede Stadium in Mumbai. Also, Qualifier 1 and the IPL 11 Final game will take place at the same venue. Totally there are nine venues for eight teams. Preity Zinta’s Kings XI Punjab will play their home games at two venues. Their first three home matches will be played at Mohali and other four home matches are at Indore. All other seven teams will play seven matches at home venue which all mentioned below and seven other matches at away. Eliminator and Qualifier 2 will be played at Maharashtra Cricket Association’s International Stadium in Pune. Super Kings: MA Chidambaram Stadium in Chennai. SunRisers: Rajiv Gandhi Intl. Cricket Stadium in Hyderabad. Royal Challengers: M. Chinnaswamy Stadium in Bengaluru. *Maharashtra Cricket Association’s International Stadium in Pune.